With permission from totalhealth Magazine, Volume 28, No. 4. For subscription information, call 1-888-316-6051. 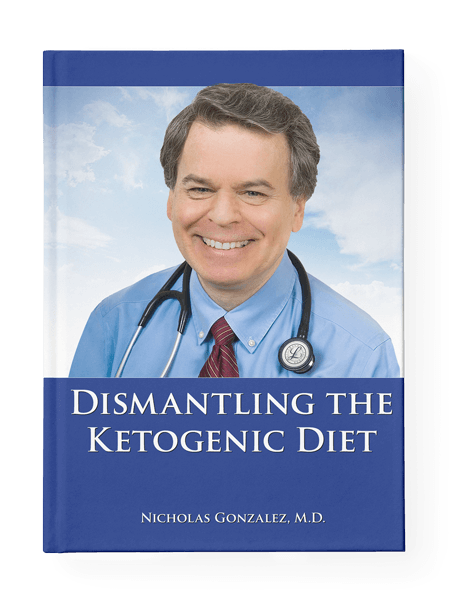 As a medical student at Cornell in 1981, Nick first began investigating the work of the late and very eccentric Dr. William Kelley, the dentist who developed a nutritional enzyme approach to cancer during the 1960’s. His research mentor at the time, Dr. Robert Good – then President of Sloan-Kettering and recently described in his obituary as the “Father of Modern Immunology” – suggested as part of Nick’s project he evaluate all patients with appropriately diagnosed inoperable pancreatic cancer treated by Dr. Kelley within a specific time frame (Nick ultimately chose the years 1974-1982). 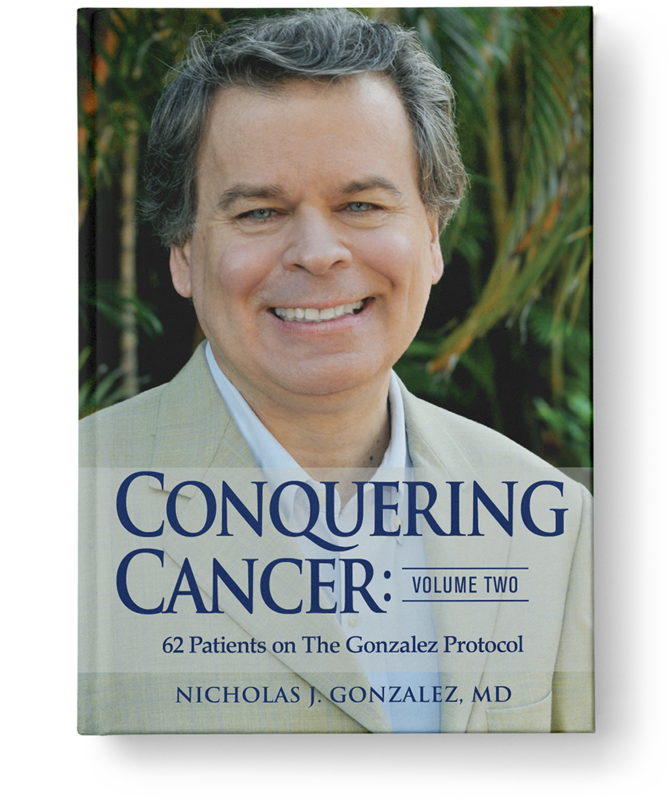 Dr. Good, wise teacher that he could be, encouraged Nick to focus his efforts on this particular malignancy, since pancreatic cancer was at the time, as it is today, an invidiously aggressive illness that kills most of its victims within 3-6 months. Dr. Good realized Kelley treated other types of cancers as well as non-cancer illnesses. But he felt that if Nick could show Kelley had even a few significant victories against this disease, his work would deserve to be taken more seriously – after all, no one in orthodox oncology anywhere could claim any success with inoperable pancreatic cancer. In Nick’s searchings through Kelley’s files he did indeed discover a series of remarkable patients diagnosed with pancreatic cancer who had done extraordinarily well for years under Kelley’s care. He documented these unusual cases as a part of his lengthy report on Kelley’s methods, completed as fulfillment for his immunology research training under Dr. Good – who by that time had moved to All Children’s Hospital in Florida. Though the original manuscript remains unpublished to this day [note: One Man Alone was later published in 2010 by New Spring Press and also available on Amazon] – due to the usual biases in the medical and publishing world – by the late 1980s, long after Kelley had closed down his office and disappeared from view, word of Nick’s study and his unusual findings with pancreatic cancer spread quickly in the alternative world. In 1993, Dr. Michael Friedman, then Associate Director of the National Cancer Institute, suggested Nick pursue a small pilot study, evaluating his nutritional approach in patients diagnosed with inoperable pancreatic cancer, for reasons similar to those of Dr. Good 12 years earlier. He felt that if Nick had the guts to put his therapy to the test against pancreatic cancer in a formal clinical trial and the treatment showed some benefit even in a few patients, the NCI would have to move to the next level with his work and support large controlled clinical studies. By “benefit” Dr. Friedman meant three out of 10 patients living one year. Nick far exceeded Dr. Friedman’s definition of success; of the eleven patients in the study, eight with very advanced stage IV disease, nine lived at least a year, five lived two years or more, and two lived beyond four years. Based on these well-documented results, published in a peer-reviewed journal in 1999, the NCI agreed to fund a comprehensive controlled study, originally designed to pit The Gonzalez Protocol® against the best available chemotherapy in patients diagnosed with inoperable pancreatic cancer. This closely followed study seems well-known within both the alternative and the orthodox medical world as one of the NCI’s first attempts to study, seriously, an alternative approach to cancer. Unfortunately, despite the earlier optimism that surrounded the project, it remains seven years later uncompleted, for many reasons that for now must be kept confidential. So though the long story of Nick’s clinical trial was told in his book What went Wrong, that project struggled along its peculiar pathway. Nick did pursue laboratory studies in a mouse pancreatic tumor model developed by the renowned molecular biologist Dr. Parviz Pour at the University of Nebraska. Again, as with the pilot study, the results were positive, impressive, published in the peer-reviewed literature, and presented at an NCI invitation-only conference. Since so much of my research, both clinical and laboratory, has involved pancreatic cancer in one way or another, it’s understandable that many familiar with our regimen associate it primarily or even exclusively with the disease, even though Nick did treat all forms of cancer as well as non-malignant illness. Nonetheless, after several conversations with his friend Lyle Hurd, the publisher of totalhealth, Nick decided to write about this particular disease once again, concentrating not on the clinical studies, but our success with patients treated in his private practice. In doing so he hoped to demonstrate that with his nutritional therapy, a number of his patients have beaten soundly this normally rapidly terminal condition in a way unmatched anywhere in the orthodox oncology literature. Nick also hoped to make the same point Dr. Good made with him in their first conversations about Kelley 25 years ago, and the point Dr. Friedman repeated years later. 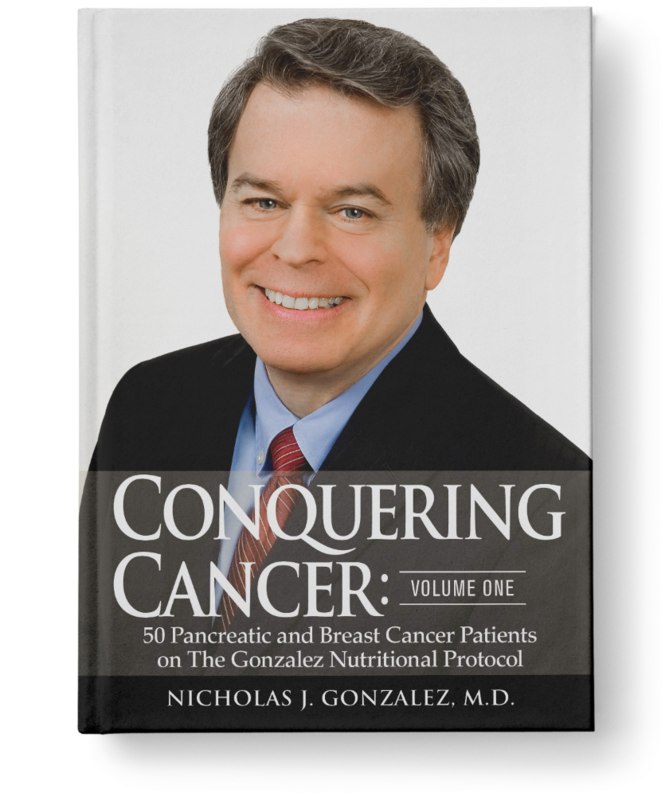 If he could document even an occasional success with inoperable pancreatic cancer, The Gonzalez Protocol® deserves to be taken more seriously. At this point, it might be useful to discuss briefly the pancreas, its anatomy and physiology, and Nick’s general treatment approach before presenting a series of case reports of patients diagnosed with the disease who have done well while under his care. Anatomically speaking, the pancreas lies in the backmost region of the upper abdomen, technically known as the retroperitoneum, directly behind the stomach. Here it sits literally fused to the posterior body wall, lying horizontally along it. In the adult, the organ is about 10-15 cms (5-6 inches) in length with a tapering shape consisting of a widened head, a narrowing body and still more narrowed tail. In one of my lectures years ago, I suggest that the pancreas looked somewhat like the head of a seagull or tern, with its head and tapering beak. I think that analogy a good one, even today. The pancreatic head fits snugly in the duodenum, the first part of the small intestine into which the partially digested food flows from the stomach after each meal. The duodenum itself has a well-described “C curve” shape, that wraps around the pancreatic head and receives the bolus of pancreatic enzymes that continue the digestive process. In its microscopic structure, the pancreas consists of two very distinct cell types, those of the exocrine pancreas that synthesize the digestive enzymes, and the endocrine cells that manufacture various hormones. The exocrine cells far outnumber the endocrine, making up about 90 percent of the organ’s total cell mass. These enzyme producers array themselves in nests called acini, the production centers for the main classes of pancreatic enzymes: the proteolytic group including trypsin and chymotrypsin that break down large proteins into their component amino acids; the lipases, that chop up long chain fatty acids into smaller molecules; and the amylases, that cleave complex carbohydrates into sugars such as glucose and fructose. The pancreas actually secretes many enzymes in each class, and dozens overall. The acinar cells synthesize and secrete the powerful proteolytic enzymes and the lipases as inactive precursor molecules lacking any digestive capability. Consequently, these dormant molecules pose no threat to the pancreas itself, which otherwise could be digested away. But once released into the duodenum, the precursors quickly transform into active enzymes, ready and willing to attack any food that might be arriving from the stomach. The scarcer endocrine cells also lie in nests, known as Isles of Langerhans, that lie scattered throughout the pancreas, though they tend to be concentrated in the tail region. Scientists recognize three categories of islet cells, each of which synthesizes a particular hormone. The alpha cells secrete glucagon, which stimulates the liver and muscle to release stored carbohydrates as the need arises, such as between meals or when food is scarce. Beta cells manufacture insulin, that serves to drive excess blood glucose into cells for use as energy or for storage during and after a meal. Delta cells produce somatostatin, which regulates the synthesis and activity of the other two islet hormones. All the endocrine cells release their respective hormone molecules directly into the bloodstream, for use at distant tissue sites such as the liver and the various muscles of the body. According to Harrison’s Principles of Internal Medicine (16th edition, page 537), in 2004, pancreatic cancer killed 31,270 Americans, making it the fourth major cancer killer. It is a particularly virulent disease, with 98 percent of patients dead within a year of diagnosis. The cause of this malignancy still eludes orthodox thinkers, though over the years they have uncovered some clues. Scientists report that cigarette smoking increases the risk three times, with up to 30 percent of cases linked to the habit. Chronic pancreatitis and obesity predispose to the illness, as does diabetes mellitus. Experts argue for a genetic component in some families, with approximately 3-9 percent of all cases thought due to such an inherited predisposition (DeVita VT, Hellman S, Rosenberg SA, Cancer: Principles and Practice of Oncology, 6th Edition. Lippincott Williams & Wilkins 2001, page 1127). I remember one patient in my practice who reported six first-degree family members had died with pancreatic cancer. However, the relationship between pancreatic cancer and coffee consumption proposed some years ago and reported in the media has now been discounted. Cancer can begin in either the enzyme or hormone secreting cells, though exocrine malignancies make up at least 90 percent of all pancreatic tumors, the much rarer endocrine tumors (also called islet cell cancers) a mere 5-10 percent. The more common form, adenocarcinoma, usually kills quickly; the conventional medical literature reports that average survival for patients with widely metastatic pancreatic adenocarcinoma at the time of diagnosis falls in the range of 3-6 months from diagnosis; earlier stage patients live on average some 10-14 months. The prospects for long term survival remain dismal whatever the stage, even after many millions invested in research over many years. In the conventional medical world, surgical resection of localized disease provides the only prospect for long-term survival, but at the time of diagnosis most patients already have widespread cancer and for them, surgery offers no benefit. Chemotherapy does little; the FDA approved gemcitabine, known as Gemzar, specifically for the treatment of pancreatic adenocarcinoma after data from clinical trials showed that patients treated with the drug lived on average 5.6 months, four weeks longer than those receiving other forms of chemotherapy. Researchers did claim that in addition to this slight survival advantage, 29 percent of Gemzar-treated patients enjoyed an improved “quality of life,” defined as less pain, increased appetite and an overall slight enhancement of their general “well being.” Though short lived, such benefits still represented an advance over previous options for the disease. Recently, investigators at a number of academic centers have reported little additional improvement when they added other powerful chemotherapy agents into the Gemzar mix. Scientists divide the rarer islet cell tumors into many subtypes, depending on the specific hormone released; for example, insulinomas secrete insulin, glucagonomas, glucagon, and gastrinomas, gastrin. These cancers may secrete these hormone products in excessive, even dangerous amounts – for example, frequently patients with insulinomas come to the doctor complaining of fainting between meals, when the extra insulin drives so much glucose out of the bloodstream that blood sugar drops precipitously. Whatever the particular type, islet cell carcinomas tend to be less aggressive than adenocarcinomas: even patients with metastatic disease at the time of diagnosis can live five years due to its inherently slow progression, but progress it usually does, eventually with fatal results. In my experience, most alternative practitioners who think about cancer recommend one diet for everyone, regardless of the tumor type, in a kind of “one size fits all” approach. Usually this proposed ideal turns out to be just another variation on the same vegetarian theme, with animal protein and animal fat demonized as the true enemy of all cancer patients and of life in general. However, as those familiar with Nick’s work know, Nick thought quite differently, believing that each of us is unique not only in height, weight and shoe size, but also in terms of dietary and nutritional needs. He relied on not one but ten basic diets, ranging from the nearly purely vegetarian to mostly red meat, with the fat, throughout the day. His predecessor Dr. Kelley spent years of his professional life insisting that one size doesn’t fit all, that each of us is biochemically and nutritionally unique and each of us requires a diet designed for our specific metabolic needs. Ironically, when dentist Dr. Kelley first began treating patients with other than dental disease in the late 1950s and early 1960s, he believed that for optimal health humans should eat vegetarian, period. However nice the theory might have sounded, in practice he discovered that vegetarianism worked only for occasional patients, and that many actually worsened eating this way. Through a process of trial and error, he learned that though some of his patients did well with a plant based diet, to his astonishment many did best when they ate red meat and only minimal vegetables and fruits, and some thrived when he prescribed a diet allowing a variety of both plant and animal based foods. I recently said, when asked to say a few words in his memory after his death, that just about everything that could be said about anybody, good, bad and indifferent had been said about Dr. Kelley – with some justification. But if we put aside his controversial nature for a moment, if Kelley was nothing else, he was a man possessed of great curiosity. As he refined his therapy over the years, he began to think about the reasons why this should be – why some of his patients thrived eating plants while others blossomed eating meat, and still others did best when consuming all types of food. 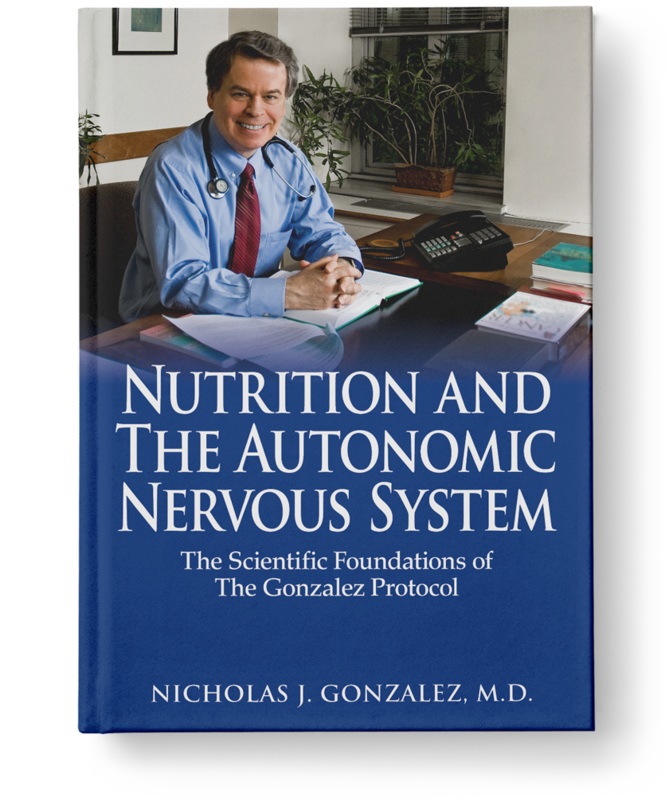 His intellectual journey led him on a long and winding path that eventually ended at the autonomic nervous system (ANS), the collection of nerves which regulates all aspects of our metabolism, such as digestion and blood flow, that do not require any conscious input. In a sense, autonomic means it works on its own, automatically, without any need for us to think much about what it might be doing at any given time. Though the details of autonomic physiology and Kelley’s elaborate model are certainly beyond the scope of this brief article, some general points deserve mentioning. The individual nerves of the ANS begin in the hypothalamus and brainstem, in an area neuroscientists call the “lower brain,” to contrast it to the “higher” brain centers of the cerebral cortex that help us think both grand and trivial thoughts, that allow us to ponder, do math, write music and fill out our income tax forms. Signals from the autonomic centers travel out of the brain to reach every tissue and organ in the body, from tiny muscles of the hair follicles of our scalp, to the sweat glands of the feet, and just about everywhere else in between. Scientists divide the ANS into two distinct branches, the sympathetic nervous system (SNS) and the parasympathetic nervous system (PNS), each consisting of its own very unique set of nerves designed to carry out a particular set of instructions. The SNS and PNS tend to work in contrary ways, in opposition to each other, not to struggle and fight, but instead to allow very precise management of our every metabolic activity from second to second. When the SNS fires, for example, heart rate increases, as does the strength of each cardiac contraction: the small arterioles of the skin and those along the entire digestive tract constrict, while the vessels that feed into the muscles and into the brain dilate, to allow easier and stronger blood flow. As a result, blood pressure rises and blood itself gets preferentially shunted from the gut and skin to the muscles and brain. Furthermore, the sympathetic nerves inhibit virtually all digestive processes and processing, including the secretion of all the various digestive juices as well as peristalsis, the series of muscular contractions that propel food along the intestinal tract. At the same time, the SNS signals most endocrine organs, including the thyroid, the adrenals, and the gonads, to release their respective hormones. The parasympathetic nerves, when firing, orchestrate the opposite chain of events; heart rate slows and cardiac contraction weakens, while the arterioles of the skin and digestive tract open wide. Blood pressure drops, and blood flows more strongly into the skin and into the various digestive organs. Meanwhile, digestive activity along the entire gut picks up, including the secretion of acid, enzymes and bile, as well as peristalsis. However, when the parasympathetic nerves gear up, endocrine activity slows considerably. Scientists traditionally teach that the sympathetic system serves as our body’s first responder in times of stress, be it physical, emotional or psychological in origin. Hopefully my cursory description above gives clues why the SNS might help us survive through times of great or even minor difficulty. When challenged, whether physically or intellectually, it helps us if blood, with its oxygen and many life-supporting nutrients, flows steadily and effortlessly to the brain to allow for quick thinking. As blood moves more efficiently into our many skeletal muscles, we can, if necessary move rapidly and with great force – to our benefit should we need to run from a fire or extricate ourselves from a crashed car. We have all heard stories of heroic feats of human strength, such as a parent lifting the end of a car to help a trapped child escape; such actions are possible, when the sympathetic system is fully active. The sudden burst of hormones from the thyroid and the adrenals helps convert our reserves of stored energy, the sugar in the liver and fatty acids sequestered in fat cells, into readily usable fuel. This too makes perfect sense, for under duress, we want our brain’s neurons and muscle cells supplied with as much energy as they might need, for as long as they need it. And at times when we are fighting for survival or struggling through a final exam, we don’t want our energy wasted on the more mundane processes of life such as digestion. So it’s to our benefit that when the SNS fires during periods of stress, digestion essentially shuts down. Though the SNS does deftly help us battle through major obstacles in life, such as a car accident, even more mundane events in a typical mundane day – an unpleasant phone call, a problem with the kids and their homework, a presentation at work – can send these nerves into high gear. We rely on our sympathetic responders from moment to moment, day in and day out, to deal with all our stresses and stressors. In contrast, the parasympathetic nervous system helps us repair and rebuild from the wear and tear of life’s daily battles, whatever they may be, both major and minor. The PNS becomes active during and after a meal, to promote digestion, to expedite the absorption of nutrients and their efficient use in all the cells throughout our body. These nerves are also busy at night, while we sleep, directing the restoration of our depleted energy reserves as well as the repair of damage done to our cells and tissues each day as we move through life in a polluted, challenging world. After years of thinking about the ANS, Kelley came to believe, as we do forty years later, that some are born with an overly developed sympathetic, and a correspondingly weak parasympathetic nervous system. In such folk, the organs normally stimulated by the sympathetic nerves, such as the heart and the skeletal muscles, along with the various endocrine glands, tend to be highly developed, even hyperactive, while those tissues normally prodded into action by the PNS – such as those of the digestive system will be inherently weak, slow to act, inefficient. On the other hand, others of us seem to be innately possessed of a hyperactive PNS, and a weak SNS. In these people, all the tissues and glands normally activated by the PNS – such as the organs of digestion – will be very efficient, while the heart, the skeletal muscles, and the various endocrine glands will be slow to respond, physiologically clumsy. For those who fall in between with a balanced autonomic set of nerves, both the SNS and PNS can fire as needed with equal efficiency, and all the tissues, organs and glands each regulates will be equally developed and equally responsive. Kelley wasn’t the first to propose that we humans could be divided into three autonomic groups, the sympathetic and parasympathetic “dominants,” as he called them, and the balanced metabolizers. The great research scientist Francis M. Pottenger, M.D., Sr. had suggested in the various editions of his classic text, Symptoms of Visceral Disease [available through the Price-Pottenger Nutrition Foundation or at Amazon], first published in 1919, that our species could be categorized in this way. More recently, during the 1940’s and 1950’s, the physiologist Dr. Ernst Gellhorn, a Professor at the University of Minnesota Medical School, documented the same, that humans fall into three general autonomic categories. All this neurophysiology is more than of just theoretical interest: both Dr. Pottenger Senior and Dr. Gellhorn believed that much if not most disease occurs when the autonomic branches are not in balance, and health requires the equilibrium be restored. Though neither of these two researchers developed these thoughts to any great practical degree, Kelley took these pioneering ideas and outlined an entire system of disease and its treatment based on autonomic imbalance. Though again, the details are beyond the scope of this article, Kelley specifically associated certain illness with sympathetic dominance, particularly digestive diseases such as ulcer disease, colitis, or irritable bowel. Such people can be predisposed to anxiety, but rarely suffer from depression, and rarely report allergies. Parasympathetics, with their very efficient gut, escape most digestive problems, but are subject to allergies, asthma, chronic bronchitis, hypothyroidism, and chronic fatigue. They can, if the parasympathetic system becomes too overly domineering, end up in serious, life altering melancholic depressions. And it was Kelley who first proposed that cancer occurs only in a state of autonomic imbalance, and that each of the two extreme groups, the sympathetic and parasympathetic dominants, fall victim to certain malignancies. The common solid tumors – the cancers of the breast, lung, colon, pancreas, liver, uterus, ovaries, prostate – Kelley believed forty years ago strike only sympathetic dominants, never parasympathetics. In contrast, the immunological malignancies – leukemia, lymphoma, myeloma – seem to inflict only those with a strong PNS, never sympathetic dominants. Balanced folk, Kelley claimed and as we see in our experience today, tend to be the healthiest among us, generally immune to the diseases of the autonomic extremes including cancer. In my 19 years of practice, I have never seen a cancer patient whose autonomic branches, when first seen in my office, proved in be in balance. Though Pottenger and Gellhorn broke important scientific ground, each in his own way, it was Kelley who first associated states of autonomic dominance with very specific dietary and nutritional needs. Kelley proposed that those with a strong SNS do best eating more vegetarian, dining primarily on plants. The parasympathetic dominants are the meat eaters, the carnivores, who thrive on animal protein and animal fat in all its forms – saturated, unsaturated and even cholesterol – while doing poorly on excessive amounts of fruits, vegetables, nuts, seeds and grains. These are the patients that just can’t tolerate grains. Balanced people, in between the two autonomic extremes, do well at a buffet (preferably organic of course) choosing and eating a variety of natural food types of both plant and animal origin, including fruits, vegetables, nuts, seeds, whole grains, eggs, dairy, fish, poultry, and red meat (though not nearly in the quantities needed by a typical parasympathetic dominant). So, Kelley had come to associate each of the three autonomic groups with specific dietary needs and specific illnesses. But, inquisitive scientist that he was, Kelley took his evolving model of human biology to the next level, explaining why this should be the case, why each autonomic type seemed to require, for optimal health, a unique diet, so different from the optimal diets of the other two groups. Carefully, with the help of the scientific literature, he began to put the pieces of this complicated metabolic jigsaw puzzle together, a process we have continued ourselves to this day. If we look first at the details of a vegetarian type diet, plant foods provide nutrients that neutralize metabolic acids, and ultimately push the blood and body fluids in an alkaline direction. In an alkaline environment, sympathetic activity slows dramatically, while parasympathetic firing strongly perks up. In addition, plant foods of various sorts, whether fruit or vegetable, provide certain minerals in large amounts such as magnesium and potassium, which together serve to slow down the sympathetics and rev up the parasympathetics. Such thoughts aren’t just from Kelley: academic physiologists have known for years that magnesium does block sympathetic activity, and potassium directly stimulates the PNS into action. Certain B vitamins richly supplied in plant foods, such as thiamin, riboflavin and folic acid, stimulate the parasympathetics and block sympathetic firing. And nuts, seeds, grains and even leafy greens provide large amounts of linoleic acid, an essential omega 6, which similarly inhibits the sympathetics and turns on the parasympathetics. So, if we put all this information together, a vegetarian type diet, because of its alkalinizing effect, because of its specific nutritional profile, its collection of minerals, vitamins, and fatty acids, will tend to slow down sympathetic activity, turn on the parasympathetics and bring the out of balance autonomic system of a sympathetic dominant into, or at least toward, balance. As the autonomic branches move into equilibrium, the various tissues, organs and glands work more efficiently and appropriately, none too strong nor too weak. Health improves, and disease, whatever it may be, tends to regress. Red meat contains large amounts of sulfates and phosphates which in the body quickly convert into sulfuric and phosphoric acid, both of which, like any metabolic acid, strongly stimulate the SNS. In addition, the four amino acids phenylalanine, tyrosine, aspartic and glutamic acid, which red meat provides in abundant quantities, one way or another do the same. Phenylalanine and tyrosine specifically serve as precursors to the neurotransmitter norepinephrine, without which the SNS can do nothing, and aspartic and glutamic acid each turn on the sympathetic centers of the hypothalamus. Certain B vitamins, like B12, found in red meat exert similar influences, activating the sympathetics, and blocking the PNS. The saturated fatty acids richly supplied in red meat, often seen as one of its detriments, also powerfully stimulate the sympathetic nerves. So for all these reasons – its acidifying effect, its amino acid, vitamin and fatty acid profile, red meat perfectly suits the needs of a parasympathetic dominant, acting to stimulate the weak SNS, toning down the overly strong PNS, and bringing the two autonomic branches – and the various tissues, organs, and glands – into more efficient equilibrium. With such balance, once again, health improves, disease tends to regress. A diet providing both plant and animal products in roughly equal amounts yields nutrients that stimulate and suppress both autonomic branches. For a balanced metabolizer, born into sympathetic-parasympathetic equality, a variety of foods will help maintain their inherent physiologic status quo. Nick, like Kelley before him, used not only diet, but also supplements, with the specific aim in each patient to move their SNS and PNS into harmony. In the alternative medical world, practitioners prescribe many supplements for many reasons, but in his office autonomic balance remains always the primary goal. For his vegetarian, sympathetic dominant patients, he generally recommended very large doses of magnesium, some potassium, but very little calcium, which he found stimulates the sympathetic nerves into action. For these people he also prescribed chromium and manganese, which have a similar parasympathetisizing effect. He also found useful the B vitamins, like thiamin, riboflavin and folate, which specifically suppress the sympathetic nerves and stimulate the PNS. He suggested these patients avoid certain Bs like B12, inositol and choline, which to the contrary stimulate sympathetic activity. Our parasympathetics, in terms of supplements, usually do best with large amounts of calcium, but must avoid all but the smallest doses of magnesium and potassium, each of which would only serve to stimulate their already hyperactive PNS, and suppress their already weak SNS. Nick did include in their protocols extra zinc, which he believed to be a sympathetic stimulant, but keep to a minimum chromium and manganese. He also limited thiamin, riboflavin and folate, but often prescribed fairly large amounts of B12, choline and inositol, each of which serves to turn on their weak sympathetic nerves while suppressing the overly active parasympathetic system. He frequently suggested for them fairly large doses of the omega-3 fatty acids for their sympathetisizing effect, often from fish oil as the most suitable source, but restrict to a minimum the omega-6 class. For his balanced patients, Nick prescribed a variety of supplemental nutrients in moderate doses that stimulate and suppress both autonomic branches, including magnesium, potassium, calcium, chromium, manganese and zinc, all the Bs, and a mixture of fatty acids, both the omega-3 and omega-6 varieties. In this way, their inherent autonomic balance stays steady, in place, moving neither into sympathetic nor parasympathetic extreme. He tried to keep them exactly where they should be, in balance. For his cancer patients, as with all his patients, Nick used diet and various nutrients, including the minerals, trace elements, vitamins and fatty acids to push their ANS into equilibrium. Though autonomic balancing remains a crucial goal for his cancer patients, as Kelley believed decades ago, it is not in and of itself sufficient to beat the disease once it has become firmly established. All his cancer patients, regardless of their autonomic profile, also took, in addition to their other supplements, large quantities of orally ingested pancreatic enzymes derived from the pig pancreas, for a direct anti-cancer effect. This enzyme product remains the mainstay of his cancer protocols, as it was for Kelley, based on the work of the brilliant Scottish scientist, Dr. John Beard. It was Beard who first suggested to the consternation of the medical world that pancreatic proteolytic enzymes represent the body’s main defense against cancer and would be the ideal treatment of the disease. This article is continued in the January/February 2007 issue of totalhealth.